For Better Posture, Don't Pull the Shoulders Back. When people think about improving posture, they sometimes think they need to just “pull the shoulders back.” But it turns out that the science doesn’t support this idea. In fact, excessively pulling back on the shoulders could worsen some back conditions, causing long-term damage. The reason why pulling back on the shoulders is a bad idea has to do with the construction of the shoulder joints. Most regular joints have a “joint surface,” where one bone travels over the top of another. But the shoulders aren’t arranged like this. They’re held in place by the sum of soft tissue forces operating on them from muscles and ligaments. In a sense, therefore, the shoulders just hang there and find a position according to how gravity acts on the surrounding tissue. If the scaffold from which the shoulders hang is in the wrong place, the shoulders themselves will be out of alignment. The problem with pulling the shoulders back is that it does little to correct the fundamental reason why people have poor posture in the first place: bad spinal alignment. All pulling the shoulders back does is stretch the anterior muscles (meaning muscles at the front of your body) which connect the shoulders to the bones in your arms and rib cage. There is no change in the shape of the spine. In fact, pulling the shoulders back can exacerbate spinal problems, making poor posture more apparent. Other methods, such as pushing the chest out and pulling the bum in can be even worse. Not only does standing like this look unnatural, but the cause of poor posture is not addressed. The spine remains in the incorrect alignment throughout. The key to improving the position of your shoulders and preventing them from slouching forward, therefore, is to deal with the cause: spinal misalignment. 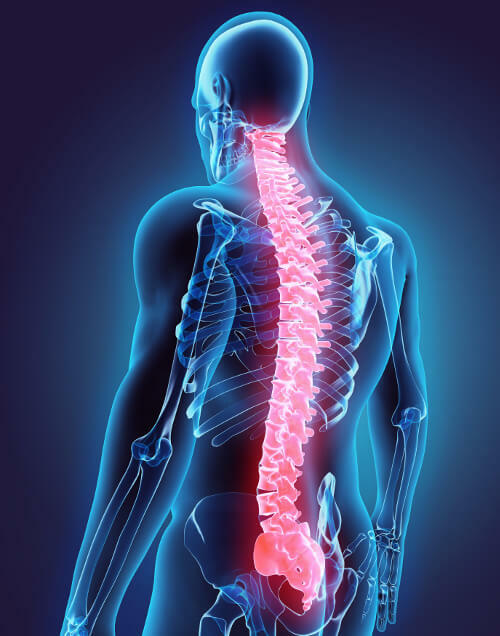 What exactly is normal spinal alignment? The spine is essentially like a tower of blocks all piled on top of one another. From the front, the spine should appear vertical, without any outward bends to either hips or shoulders. From the side-on view, things are a little more complicated. There should be two forward curves: one from the pelvis called the sacrum and the other near the neck called the thoracic spine. Two backward curves balance these called the cervical and lumbar spines. If the sum of the angles of all these curves in the spine is too great, then the head will tend to tilt forward over the center of gravity of the body – located in the pelvis – creating the need to engage the back and the neck muscles to keep the head upright. Such a position can create tension, sore muscles, bad backs, and headaches. The science behind what constitutes the perfect posture is rather limited. A study published in the Journal of Manipulative and Physiological Therapeutics in 1999 by researchers from the Spine Research Institute of San Diego in California found that the optimal sitting position for workers was leaning back between 110 and 130 degrees. Since then other researchers have found that the optimal angle might be closer to 135 degrees for relieving back strain. However, the majority of studies link poor back health and spinal position to how modern workstations are set up. Monitors are often too low or chair too high, meaning that people often end up slouching for long periods of the day. Chiropractors understand that the root of poor posture is a misalignment of the spine, not a failure to pull back on the shoulders adequately. To get the posture you want, you need to work on the shape of your spine. When chiropractors treat a patient, they are looking for something called a “subluxation,” a misalignment of the spinal joints. If a chiropractor finds a subluxation, then they will use what is often called “adjustment,” a manual technique to correct the position of vertebrae. Adjustments can be a long process but once the treatment is complete, the alignment of the spine is restored, the body can once again assume its natural, healthy posture. The problem for chiropractors, however, is that once their patients go home, their posture can deteriorate and they can end up with the same spinal problems. With so much time spent outside of the clinic, patients can often fall into bad habits. This is why a leading practitioner developed the Bax-U brace, a next-generation posture brace to maintain spinal alignment. Rather than pull the shoulders back, the Bax-U brace is designed to hold the shoulders in the right place while putting pressure on the middle of the upper back to ensure proper spinal alignment. Thanks to an extended period of development, the Bax-U brace has many advantages. It was originally developed by Dr. Romina Ghassemi after she realized that to provide holistic treatment to her patients, she needed to be able to administer help both inside and outside of the clinic. It wasn’t enough to spend an hour in the morning with a patient when their posture was compromised the other 23 hours of the day. Ghassemi realized that you could tell when a person has great posture and when they don’t. It’s about more than just pulling the shoulders back – it’s about correctly balancing the spine so that it doesn’t cause a rolling forward of the shoulders or a tightening of opposing muscle groups. The purpose of the Bax-U is to help people achieve great posture, even if they suffer from neck pain, slouching, rounded shoulders, forward head syndrome, or headaches. The brace comes in a range of neutral colors designed to be worn discreetly under clothing. So what’s the bottom line? The bottom line is to make sure that once you’ve been to the chiropractor for adjustment that your spine remains correctly aligned. The best way to do this is to use a spinal alignment brace, like the Bax-U. These posture braces are ideal for people who spend all day sitting down, bending over looking at phones and laptops, and helps them to preserve their natural, healthy spinal alignment outside the clinic.